Activity levels are based on the percent of outpatient visits in a state due to influenza-like illness (ILI) and are compared with the average percent of ILI visits that occur during weeks with little or no influenza virus circulation. The United States appears to be in the midst of an unusually severe flu season, officials at the federal Centers for Disease Control and Prevention said Friday. The flu season started early, which is never a good sign, and the flu is already widespread throughout the country, the CDC's latest report shows. Half of states are reporting especially intense flu activity. "We are currently in the midst of a very active flu season with much of the nation experiencing widespread and intense activity," CDC Director Brenda Fitzgerald told reporters during a briefing. Based on the latest available data, the United States could be experiencing one of the most severe flu seasons in years, possibly similar to the severe 2014-2015 flu season, officials say. 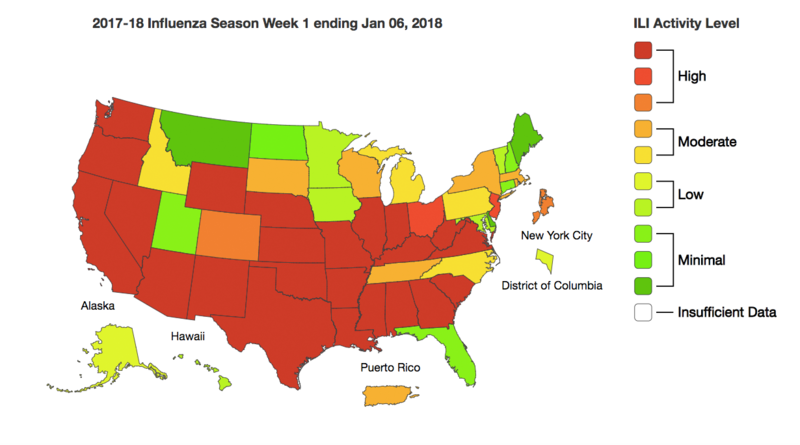 "Flu is everywhere in the U.S. right now. There's lots of flu in lots of places," says Dan Jernigan, director of CDC's influenza division. Officials cautioned, however, that the flu is very unpredictable. So there's a chance the season could slow down quickly or end early, making it a more normal flu season. But the most recent data show that the proportion of people rushing to their doctors to get treated for the flu has already hit 5.8 percent, which is as high as that number gets during the peak of a really bad flu season, the CDC says. In addition, the rate at which Americans are being hospitalized for the flu almost doubled in the last week, to 22.7 for every 100,000 hospitalizations, according to the CDC. Those are two of the key ways the CDC monitors the severity of a flu season. So far, 20 children have died from the flu, compared with a total of 101 last season. During the 2014-2015 flu season, 40 million Americans got the flu, 19 million people went to the doctor to get treated for the flu, and 970,000 people were hospitalized. Officials, cautioned, however, that the hospitalization rate for the flu so far this year is slightly below the 2014-2015 rate. The main reason the flu appears to be so severe is that it's a strain known as H3N2. That strain tends to make more people sick, and the people who get the flu tend to get sicker. It's especially dangerous for children and the elderly. "When H3N2 is prominent, we tend to have a season with far more hospitalizations and deaths," Fitzgerald says. To make matters worse, the vaccine may only be about 30 percent effective against that strain. That is better than the 10 percent effectiveness reported in Australia, which has its flu season before the United States does and often predicts what will happen in this country. Nevertheless, health officials are urging people to get vaccinated. Any protection is better than none. And the vaccine may end up being more effective, especially if other strains of the flu become more common. The vaccine is more effective against those other strains. The vaccine can also lessen the severity of illness in people who get sick. The flu season may be peaking in this country, but it could continue for many more weeks. So even though it takes two weeks for the vaccine to start protecting people after they get vaccinated, it's still worthwhile to get vaccinated, they say. "While our flu vaccine is far from perfect, it is still the best defense we have," Fitzgerald says. Officials are also encouraging doctors to treat some flu patients with antiviral drugs quickly, including children, the elderly, people who get severely ill and those suffering from other health problems. While there are spot shortages of antiviral drugs, the overall supply is plentiful. The flu season is bad this year. That's the message today from the Centers for Disease Control and Prevention. NPR health correspondent Rob Stein is here with details. Hey, Rob. ROB STEIN, BYLINE: Oh, hey, Ari. SHAPIRO: Health officials did warn us about this. So just how bad is it? STEIN: It's pretty bad out there, Ari. You know, the flu season has started early. And that's never a good sign. And it really took off early in the south and spread quickly around the country. And the latest data released today from the CDC shows that it's really pretty much everywhere. The flu's pretty much everywhere in the country right now. And it's really intense in dozens of states. And it's reached epidemic levels. So the proportion of people who are rushing to their doctors to get treated for the flu is as high as it ever gets in a really bad flu season already. And the percentage of people who are in there - up in the hospital to get treated for the flu, it doubled in the last week alone. STEIN: So, you know, we're hearing reports about ERs being overrun in California, pharmacists - pharmacies running out of antiviral drugs. And at least 20 kids have already died from the flu this year. SHAPIRO: Wow. What makes a bad flu season more intense than a regular one? STEIN: Yeah. So starting early, that's one factor. But a big factor this year is the particular strain of flu that's dominating. It's called the H3N2 strain. And it's notoriously nasty. It's the kind of bug that makes more people sick. And when they get sick, they get sicker. And it's especially dangerous for the people who are the most vulnerable to the flu, like kids and older people. SHAPIRO: Does this just mean that most people didn't get the flu vaccine? STEIN: No. The proportion of people who are getting - who've gotten vaccinated so far this year is pretty much on track for what it is most years. The problem, again, is this H3N2 strain of the flu. It tends to mutate when the vaccine is being made. And that's exactly what happened this year. STEIN: So the vaccine doesn't work as well. And in Australia, which has its flu season right before ours, it looks like it may have only been about 10 percent effective against this strain. SHAPIRO: Only 10 percent effective? STEIN: Yeah, only 10 percent. Now, officials in this country are saying look; we think it's going to work better in this country, but they're saying at best it may be around 30 percent effective. So that's leaving a lot of people pretty vulnerable. SHAPIRO: Suddenly, the suit of armor I thought I was wearing seems a lot less secure. SHAPIRO: So is there any point in getting a vaccine in that case? STEIN: Yes, definitely. There's - people should definitely still get vaccinated. And there are lots of reasons for that. One is, you know, any protection is better than none. And if you get vaccinated - even if you get sick, you might not get as sick as you would've gotten if you hadn't gotten vaccinated. Another reason is that if other strains of the virus start to dominate, the vaccine works better against them. So you'll be protected against those other strains if they start to become more common. And although the season appears to be peaking right now, it could go on for weeks and weeks and weeks. So there's plenty of time for the vaccine to protect you. SHAPIRO: This all sounds very dire - people going to the hospital, people dying. How worried should most Americans be? STEIN: Well, so, you know, the thing about the flu is that it's notoriously unpredictable. You know, it could go either way. It could be that, you know, the season is peaking now and it could peter out really quickly. And it started earlier. And it could end early. And it could end up in the end just being an average year. But if it goes on for weeks and weeks and weeks, it could end up being the really nasty flu season year that people have been worrying about for a while. SHAPIRO: You said that the flu can mutate as they're developing the vaccine. Is there a more updated vaccine? Should those of us who got a shot months ago get a new one? STEIN: No. Unfortunately, there isn't. There's a lot of research going on to try to develop better vaccines. That's a really intense area of research. And a lot of people are calling for more money to do just that because we need to have a better vaccine they can rely on year after year. But at the moment, unfortunately, that's just not available. SHAPIRO: Otherwise, just wash your hands a lot, stay home if you're sick, cover your mouth if you cough, all the regular advice. STEIN: That's right. And that makes a big difference, really. SHAPIRO: NPR health correspondent Rob Stein, thanks a lot. STEIN: Oh, sure. Thanks, Ari. Transcript provided by NPR, Copyright NPR.